Traces the Social: Lessons from Firewatch and Rapture. Traces – what is left after an action – are fundamental to understand the reality we inhabit. Video games such as Gone Home (Fullbright, 2013), Bloodborne (FromSoftware, 2015), Sunless Sea (Failbetter Games, 2015), The Last of Us (Naughty Dog, 2013), Portal (Valve, 2007), Half-Life 2 (Valve, 2004), and Bioshock (Irrational Games, 2007) have used the notion with great skill. They intelligently introduced the idea of trace as part of their mechanic and narrative universes. Everybody’s Gone to the Rapture (The Chinese Room, 2015) and Firewatch (Campo Santo, 2016) join this distinguished list of titles, where traces are handled according to their significance. Drawing on Bruno Latour’s work on the social as the articulation of heterogeneous elements and Michel Maffesoli’s reflections on the eternal instant, I examine the way in which both Firewatch and Everybody’s Gone to the Rapture help us understand how the social bond is forged (and torn) in the banal, the superficial, and the mundane, which is, in the end, what we all have in common. What is social reality? Or to be more specific: What are sociologists referring to when they talk about the social and social reality? Answering these questions involves moving beyond considerations of a theoretical or methodological order, as they not only point toward a specific form of doing sociology but to the reality that is being studied. They imply an ontology of the social, that is, the model of social reality assumed by every theoretical starting point. In his book, Reassembling the Social, Bruno Latour (2007) proposes the use of a sociology of associations in contrast to a traditional sociology of the social. He starts from the premise that the social is not a substance. According to this approach, the social is not the material from which things, events, relationships, factors, practices, structures and, in general, any element of reality can be made. In short, the social is not a property or state of the real, but is instead the process through which the real is constituted. If, for Durkheim (considered one of the founding fathers of sociology), as found in his The Rules of Sociological Method, the first and most basic rule is to consider social facts as things (2014: 29), here the social is not a substance, but is considered as the product, always contingent and in continual reproduction, of the articulation of distinct ingredients: actors, associations, processes, practices, etc. Attention is focused on movements, displacements and transformations through which the social is made and unmade, which permits us to explain and observe the emergence of formations, structures, institutions, relations and social agents. In this regard, all (re)production of the social leaves traces. These are the remains that the social produces and appear in the form of discourses, memories, notes, inscriptions, laws, texts, works, buildings, organigrams, pamphlets, etc., things that can be mapped. It is a principle of the social that permits its traceability, its monitoring; in short, enabling the possibility of doing sociology (it is also applicable to the vast majority of disciplines). Without remains, without traces, without marks or footprints, it would be impossible to do so. The social is visible only by the traces it leaves (Latour, 2007: 8). Firewatch and the Impossibility of Leaving No Trace. The X-Files, the cult science fiction TV series created by Chris Carter, is invariably linked to its popular leitmotiv: The truth is out there. However, as the series’ fans surely know, there are more phrases – turned into principles – that are indelibly embedded in the collective imaginary of its universe such as I want to believe, Resist or serve, or Nothing disappears without a trace. I will focus on the latter idea, ‘nothing disappears without a trace’, because it also presupposes a particular ontology: everything that is and does something will always leave an impression, a mark, or a trace. Without those traces, without signs of any kind of activity or transformation, then, we will not be able to deal with or understand that reality. Moreover, it would be a non-existing reality for all intents and purposes, part of the unthinkable. May Chris Carter have read Latour? 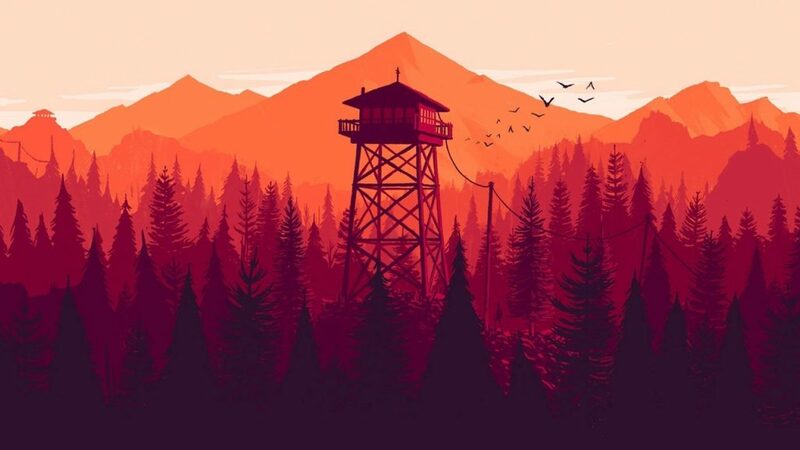 Firewatch is the perfect title to deepen our understanding of this approach, to teach us the importance of traces as the fundamental sign of activity and existence. Towards the end of the game, let’s not enter into too much detail, we can read at the bottom of a handwritten note the following words: ‘Leave no trace’. The intention of whoever wrote the note was to not leave any trace. The irony of the discovery is so formidable that we can almost see how reality falls apart at the seams. Those who did not want to leave a trace ended up leaving one when they indicated they did not want to do it. After all, like in Latour’s theory, reality is formed by these discontinuous traces; it is how we know it exists, moves, and transforms. And traces are a constant in Firewatch. Traces that convey to us that the impenetrable peacefulness of the forest is nothing more than the canvas where a vivid universe, traversed by both trivial and heart-breaking events, is captured. With the exception of some portraits, we will not see any human face throughout the game; we virtually will not come across with any living thing either. It is not necessary. We have the notes that two forest rangers interchanged in the past, the marks that a bear has left on the surface of a tree’s trunk, the charred remains of a controlled burning, a trail of beer cans, belongings that were abandoned in haste, a bag that hangs from some branches, open wounds in the shape of guilt with which the past reminds us that our soul was torn apart. Marks, footprints, and traces. And at the top, in her watchtower, Delilah, who could easily be the echo of a past life that we pick up with our walkie-talkie. The fact that the event that triggers the beginning of the story rests on the terrible experience of the loved one that progressively loses her memory – that set of traces that links us with the world and its inhabitants, sinking into oblivion, reinforces the importance of the trace. Without it, we are nothing; or worse yet, we do not know that we were. Then, like Harry, fleeing is the only thing we can do. But nothing disappears without a trace. Promotional art of Everybody’s Gone to the Rapture. The Eternal Instant in Everybody’s Gone to the Rapture. 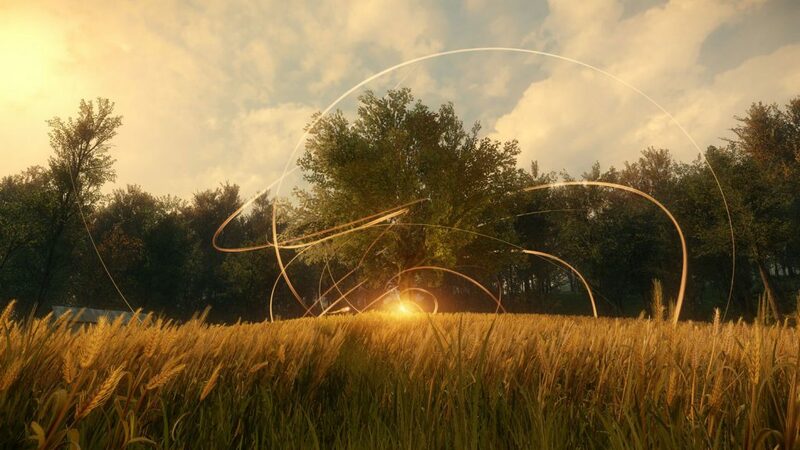 Everybody’s Gone to the Rapture proposes an experiment. As in those thought experiments that proliferate in philosophy, theoretical physics, and social studies of science, the game suggests a hypothetical scenario: What if we could be privileged witnesses of the instant that follows the end of the world? What would we experience? What would have been left behind? What aspects of our lives would be relevant? The Chinese Room’s work enables us to navigate the calm that comes after the storm, dwell in the eternal instant of Maffesoli’s theory, and pay attention to the traces of a past social life: those carved on the territory, on the buildings, on the objects that were hastily abandoned. The calmness of the environment, the suspension of time, and the majesty – horrifying and tragic at moments – of the landscape, is what allows us to notice those traces. And among them, the echoes of conversations, occurrences, and reflections of a more or less recent past. Echoes that, as a reverberation in the continuous space-time, briefly alter the post-apocalyptic peace. Those echoes, which are outside time, give the experiment full meaning along with the physical traces (handkerchiefs tainted with blood, the rooms’ layouts, chairs in a circle, dead animals, projectiles containing nerve agent, maps, open suitcases, drawings, books, notes on a blackboard, graffiti, memos, posters announcing a play, broken objects, abandoned cars, and so forth). All those elements are able to give meaning to the situation because they empty the universe of the noise of the social that it is always enveloping (and masking) it. By doing so, it allows us to observe the fundamental elements of the real, even if these are just a series of disjointed and disorganised fragments. Precisely, the controls of Everybody’s Gone to the Rapture are designed to be part of an unhurriedly contemplative dynamic, since, unlike most video games, it is not possible to run (although the game enables the possibility of a small speed increase, which is, nonetheless, continuously interrupted). Thus, the game forces us to think inside its ephemeral eternity. According to Michel Maffesoli (2001), once the historic, linear, and teleological temporality of modernity is broken, what emerges is the non-time of the everyday life ritual. Everybody’s Gone to the Rapture is a theoretical experiment brought to life in the shape of a video game. It is a very efficient experiment, which let us explore how social bond is forged and torn through the traces that the mundane, the quotidian, the superficial, and the banal leave behind. The particularities of the stories narrated, which are about personal relationships, fear, love, failures, projects, betrayals, mistakes, knowledge, a sense of community, and so on, are irrelevant. The important thing is that The Chinese Room’s work shows us the fundamental mechanisms by which we are able to grasp a tiny part of meaning in the maelstrom of the social. Trapped in that eternal instant, thanks to the force that triggers the rapture, we are in a better position to understand everything. All in all, what Firewatch and Everybody’s Gone to the Rapture teach us is a simple but valuable lesson: Understanding social reality means we understand the traces it leaves behind. Durkheim, Emile (2014) . The Rules of Sociological Method. New York: Free Press. Latour, Bruno (2007). Reassembling the Social. An Introduction to Actor-Network Theory. Oxford: Oxford University Press. Maffesoli, Michel (2001). El instante eterno [The Eternal Instant]. Buenos Aries: Paidós.